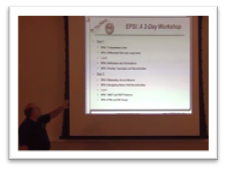 Last year, Signal Integrity Evangelist, Dr. Eric Bogatin announced the end of his famous signal integrity classes. At the time I remember thinking to myself, “What’s next for Eric”? If you know Eric, like I do, you realize that the end of one phase of his career usually means the start of the next one. And now we know what that is. You see, Eric has been busy the last six months (January-June-2014) preparing to launch his new Teledyne Lecroy Signal Integrity Academy web portal. Eric is currently a Signal Integrity Evangelist with Teledyne LeCroy, and on the faculty at the University of Colorado at Boulder, where he recently moved to from Kansas. He has a BS degree in physics from MIT, and MS and PhD degrees in physics from the University of Arizona in Tucson. He has held senior engineering and management positions at Bell Labs, Raychem, Sun Microsystems, Ansoft, and Interconnect Devices. Prior to being acquired by Teledyne Lecroy, he ran his successful company, Bogatin Enterprises, along with his wife Susan, where they provided signal integrity training. I met and got to know Eric back in 2008, when we collaborated on our first DesignCon paper for 2009 titled, “Practical Analysis of Backplane Vias”. We were privileged to win a best paper award that year. Since that time we have worked on several projects together, and have become good friends. The last project we worked on was for a DesignCon2013 paper titled, “Dramatic Noise Reduction using Guard Traces with Optimized Shorting Vias”, which also won a best paper award. Over the years, I have studied much of Eric’s work through his many papers, articles, webinars, blogs and content from his previous web site. I always made it a point to attend all of his presentations at any conferences I attended. I have his first edition “Signal Integrity Simplified” book as well. It has been one of my go-to books when starting any of my research projects or concepts I am trying to grasp. Like my other go-to signal integrity books in my library, it is well marked and used; although this one seems more so than others. Having the privilege of working with Eric has also enriched my learning experience. Over the years, I always wished I could have attended some of his classes; but due to travel cost and time away from the office, it could never be justified. Now, with the beauty of the internet, the classes can come to me. I can choose to watch what I want; when I want; as many times as I want; on whatever device I want. My iPad is a perfect choice! For a yearly subscription fee for individuals or corporations, you have the opportunity of watching any class or lesson anytime. All the content is in the form of short, concise video lessons lasting 5 to 15 minutes. Slides are available for download and I suggest downloading the respective slides prior to watching the presentation so you can make notes as you go along. The initial three courses: Essential Principles of SI; Advanced Gigabit Channel Design; S-Parameters for SI; are based on his most popular public classes. Once subscribed, you are offered an “all you can eat buffet” of all the lessons. There are more courses and lessons planned in the future. « Dr. Howard Johnson; a great teacher, mentor and friend.